The Selectable Drag and Drop option allows respondents to rank their preference by dragging and dropping images or text from a left “bucket” to a right “bucket”. This version of the Rank Order question should be used if you don’t want respondents to have to rank all options. Select the Option Type. 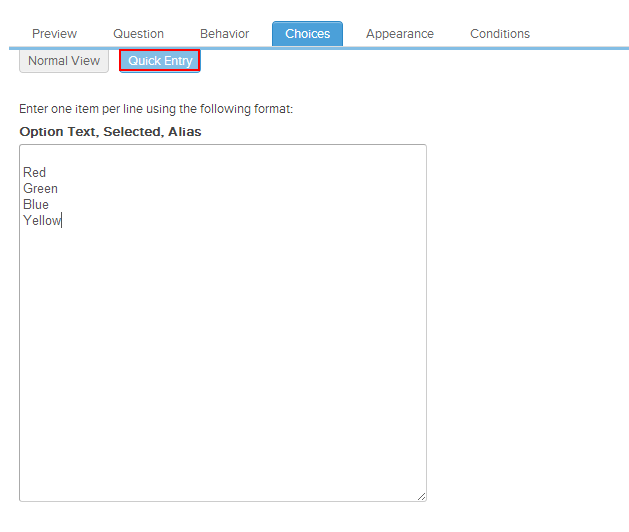 You have the ability to display possible answer options as Text or Images. Set the Required number of options the respondent must rank. 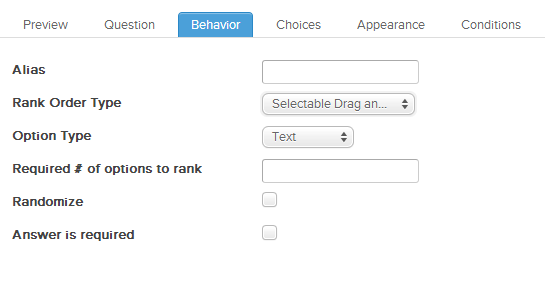 If you leave this blank, they will be required to rank all options. Check ‘Randomize’ to randomly reorder the answer options for this question every time the survey is opened. Randomizing answer options can help prevent answer bias. Check ‘Answer is required’ to make this a required question. Respondents will not be able to proceed in the survey until an answer is selected. The Drag and Drop Order option allows respondents to rank their preference by dragging and dropping images or text in place in a single “bucket”. This version of the Rank Order question should be used if you want respondents to have to rank all options. 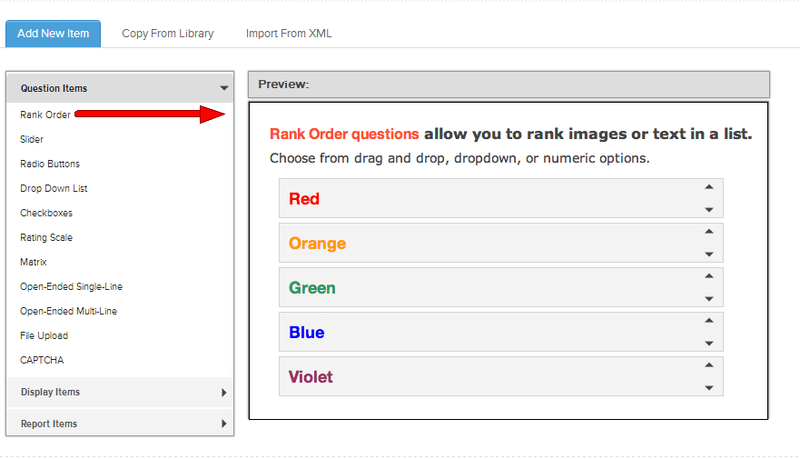 The Numeric Rank option allows respondents to enter the number of their preference for each text or image option shown. So, they would enter a “1” for their first choice, “2” for their second choice, and so on. Select the required number of available options that must be ranked. The Drop Down Order option allows respondents to choose the number of their preference from a dropdown list for each text or image option shown. So, they would choose “1” for their first choice, “2” for their second choice, and so on. Set the Required number of options the respondent must rank. 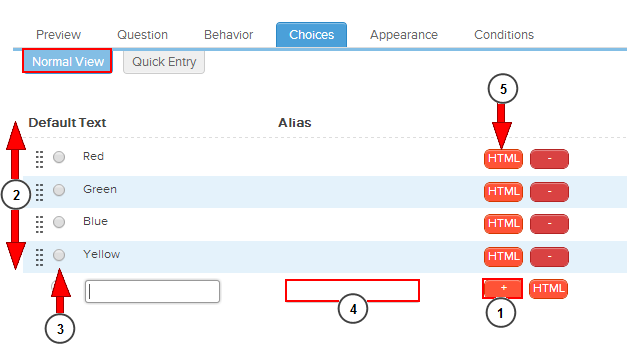 Enter possible answer options line-by-line in the Normal View on the Choices tab. Select the orange ‘+’ icon to add a line. Select the red ‘-‘ icon to remove a line. Select in the row to edit answer text. Modify answer text in HTML. 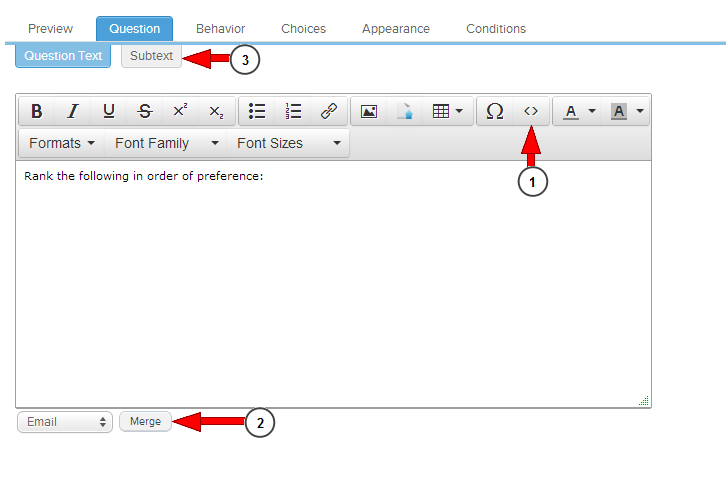 Merging can be applied here to insert the answer to a previous question, User Attribute, or Response Property into the answer choice field. Optionally, you may copy and paste a list of answer choices from a text file into the Quick Entry view on the Choices tab. The uploaded image will be visible in the preview window. You will see an image URL above the preview, indicating that the image has been uploaded to your Checkbox account. If you are satisfied with your image, select Set the Image at the bottom of the window. The image will appear on the Choices tab. Create an alias for the image (required). Select the orange ‘+’ icon. This will add your image as a possible answer option. To make this image the default selection when a respondent lands on this survey page, select the radio button to the left of the image. Display descriptive text with the image by entering text into the Label field (optional). Change the position of the image label. NOTE: only appears when ‘Image’ is selected as the Option Type on the Behavior tab.